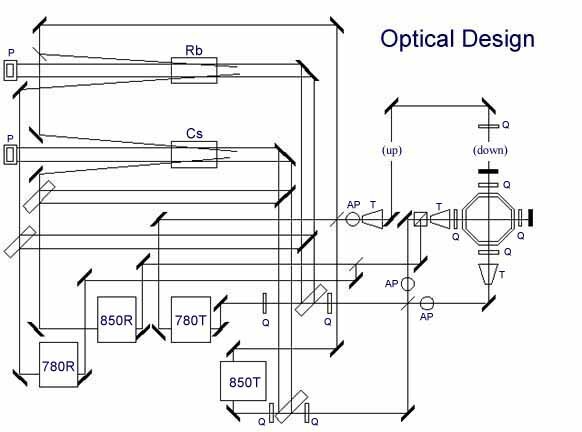 We have developed a magneto-optical trapping apparatus which permits simultaneous cooling and trapping of cesium and rubidium in a compact octagonal vapor cell. 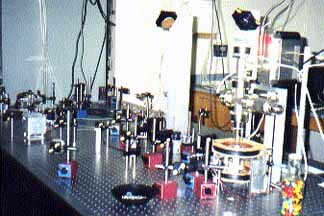 The background vapor pressures of each atomic species are independently controllable, as are the intensities and frequencies of the respective trapping and repump lasers. Trap sizes and positions are determined by a pair of CCD cameras which view the trap from orthogonal directions, and loading times for each species are determined by PMT observations of trap fluorescence. 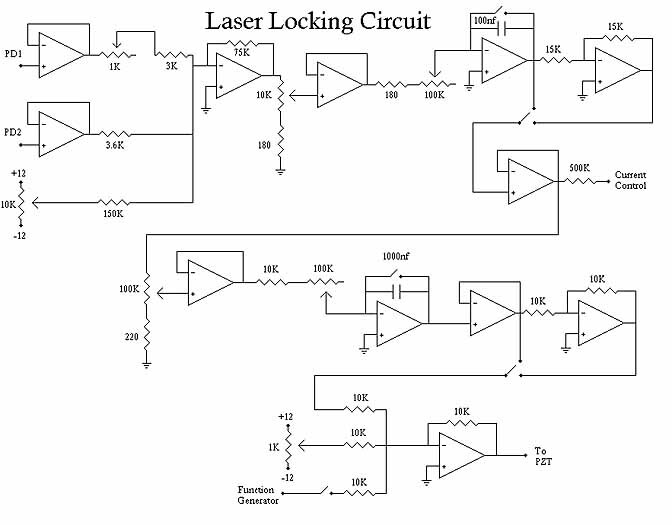 Each saturated absorption cell is used to lock a trap laser and a repump laser. 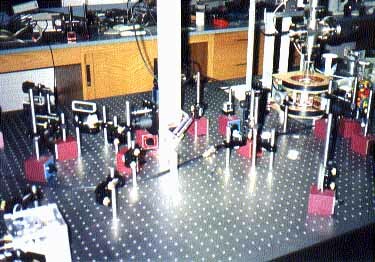 The lasers each contain an internal beamsplitter, producing two output beams. The output beams from all four lasers are combined before entering the trap cell. Thick glass plates are used to pick off probe beams for saturated absorption spectroscopy. The trap beams are then combined using nonpolarizing beamsplitters to preserve the horizontal polarization of the trapping beams. These elliptical beams are then sent through anamorphic prisms to stretch the beams horizontally so that the resulting beams are circular. These are broadened by 4X telescopes and sent through quarter wave plates to make the beams circularly polarized. The shape and polarization of the repump beams are less important, and these beams are sent into the trap cell on only one axis. When one of the trapping laser beams going to the trap is blocked, the trap disappears. After unblocking this beam, the trap slowly reforms. 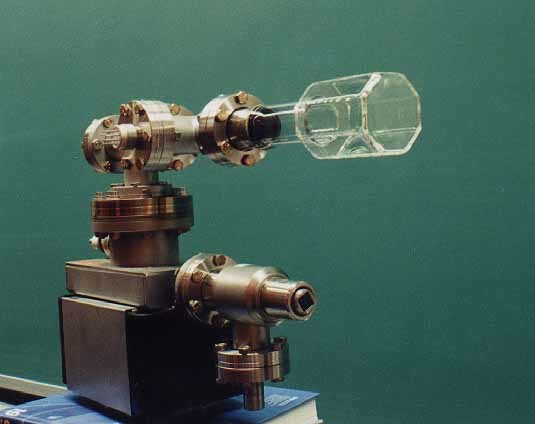 This experiment is performed with the Cesium trap, the fluorescence from which is detected by a PMT. 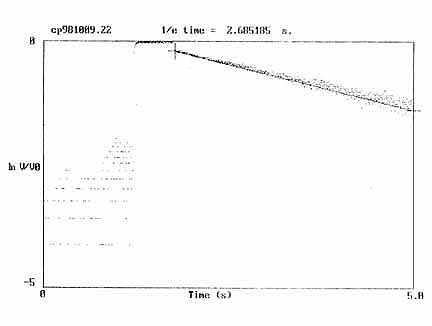 The above graph shows the log of this exponential growth, with the 1/e trap fill time as calculated from the slope of the line. The background pressure for this trap was relatively low, resulting in a slow fill time of 2.68s. 1. Christopher Roy Monroe, Ph.D thesis, University of Colorado (1992). 2. C. Wieman, G. Flowers, and S. Gilbert, AJP, 63, 317-330 (1995). 3. G. D. Rovera, G. Santarelli, and A. Clairon, Rev. Sci. Intrum., 65, 1502- 1505 (1994).